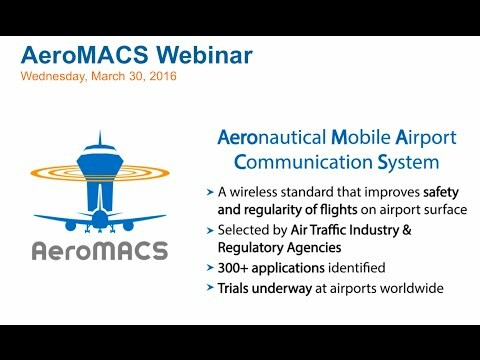 The WiMAX Forum with the collaboration and participation of its Board of Directors, Member Companies, Working Group Representatives, and industry leaders, continues to produce important work to increase awareness, support and advance the Aeronautical Mobile Airport Communication System (AeroMACS), WiGRID, and the WiMAX technology. Last month, the WiMAX Forum has announced the election of its new Board of Directors member. Kathy Nelson is the Director, Technical Product Marketing & Industry Relations at Ondas Networks. Ondas Networks Inc. (formerly Full Spectrum Inc.) is a wireless networking company that designs and manufactures its multi-patented, Software Defined Radio (SDR) platform for Mission Critical IoT (MC-IoT) applications. For more information, please click here. Additionally, on March 13 the WiMAX Forum hosted the first AeroMACS conference of 2019 collocated with World ATM Congress in Madrid, Spain. Participant companies included: ANA - Aeroportos de Portugal , Aviation Data Communication Corporation (ADCC), Avicom Japan, DigiCert, EUROCONTROL, Leonardo Company, Powertech Labs, RIOgaleao, Sectigo, Siemens, and Telrad Networks. AeroMACS 2019 - Madrid was a great success with participants from around the world raising awareness about the value of this secure and standardized wireless broadband technology to support the safety and regularity of flights on the airport surface. The presentations were well-received and further drove collaboration among industry players to support the technology as an industry standard. This month on April 9-11, at the ICNS Conference in Herndon, Virginia, the WiMAX Forum President Declan Byrne participated at the Plenary Panel - Future Communications Infrastructure Status with other industry experts from FAA, Honeywell, DLR, Inmarsat and Iridium, and presented the latest AeroMACS developments. At the Technical Session the WiMAX Forum presentation evolved on "AeroMACS: Standardized Solution Enabling Secure Connectivity Worldwide at the Airport Surface." AeroMACS was a relevant topic among participants with a series of in-depth presentations addressing worldwide deployments, current applications, successful implementations and other details. Also, in April the WiMAX Forum announced an ecosystem progress towards WiMAX Forum AeroMACS Certification with the notice to the market that Siemens has successfully completed both Protocol Conformance Testing (PCT) and Radio Conformance Testing (RCT) certification phases at the Powertech labs. Complete certification (Interoperability Testing (IOT), PCT and RCT) of multiple products by a variety of manufacturers is expected to be held in the first half of 2019 at the AeroMACS PlugFest. We will continue to increase awareness of, educate, and meet with industry leaders worldwide about implementing and developing WiMAX, AeroMACS, and WiGRID networks in ways that will best serve all stakeholders. Our focus has been to share key lessons, concrete knowledge, and work together for the benefit of the industry. Our involvement in these events has proven to be the right strategy, fostering a prosperous environment and future for the WiMAX ecosystem. We are seeing concrete results from our activities in the industrial markets particularly through AeroMACS and Smart Energy events, which have provided excellent exposure, reception, and engagement. For more information about our events, please visit: WiMAX Forum Events. To foster a prosperous environment and future for the WiMAX ecosystem, the WiMAX Forum with the participation of our Member Companies will host, attend, and participate globally with speakers in key industry events. Through our events, speaking opportunities, seminars, and webinars, we are reaching out to diverse audiences in the WiMAX community. Please reach out to us if you have any questions or comments. We at the WiMAX Forum wish you a great end of month and hope to see you soon! The WiMAX Forum®, the leading organization that certifies and promotes the compatibility and interoperability of broadband wireless products based upon IEEE Standard 802.16, is proud to announce an ecosystem progress towards WiMAX Forum Aeronautical Mobile Airport Communication System (AeroMACS) Certification with the notice to the market that Siemens has successfully completed both Protocol Conformance Testing (PCT) and Radio Conformance Testing (RCT) certification phases at the Powertech labs. The WiMAX Forum®, the leading organization that certifies and promotes the compatibility and interoperability of broadband wireless products based upon IEEE Standard 802.16, announces the election of its new member to the Board of Directors. Kathy Nelson is the Director, Technical Product Marketing & Industry Relations at Ondas Networks. Kathy has 25 years of experience as a telecommunications engineer in the electric utility industry and leads Ondas Networks relations and product marketing across all industrial verticals. The WiMAX Forum would like to extend a special welcome to the newest member from 2019 Ondas Networks. The WiMAX Forum is committed to delivering the value necessary for our members to get the most from their membership, and we are always engaging with individual members to discuss how we can better serve them. If you are interested in speaking with our leadership team on our specific initiatives or have any questions, please send a message to Membership@wimaxforum.org. The WiMAX Forum organizes its technical activities through a number of Working Groups that produce technical requirements, develop technical specifications, and advise the forum. The Working Groups are chartered by the WiMAX Forum to bring together content experts from member companies to collaborate and contribute to specification development, harmonize documents, and perform other tasks that the WiMAX Forum has determined to be necessary or useful. The WiMAX Forum Working Groups are key to the development of WiMAX technology. The WiMAX Forum Working Groups are currently focused on AeroMACS, Smart Energy, product certification and various spectrum access solutions. A number of activities are scheduled to take place this year and we need the help of your technical experts in these groups. It is a crucial time for your organization to influence and leverage the Working Groups activities and contribute to the development of the market. If you are interested in participating in our Working Groups, please contact us at info@WiMAXForum.org and we will be glad to speak with you about this opportunity. The Aviation Working Group (AWG) and the AWG Certification Task Group have been making significant progress and achieving important milestones. The AWG is working on several technical activities including: AeroMACS Product Certification, AeroMACS Public Key Infrastructure (PKI), FCC AeroMACS Petition for Rulemaking, and other initiatives to support AeroMACS as the standard selected to improve the safety and regularity of flights. This month, the WiMAX Forum announced that Siemens has successfully completed both Protocol Conformance Testing (PCT) and Radio Conformance Testing (RCT) certification phases at the Powertech labs, in pursuit of total AeroMACS Certification for their products. WiMAX Forum Members AeroMACS manufacturers will be participating in an AeroMACS PlugFest at the AeroMACS Designated Certification Laboratory (ADCL) to achieve complete certification (Interoperability Testing (IOT), PCT and RCT) of multiple products, expected to be held in the first half of 2019, as details concerning this event are finalized, we will be certain to keep you informed. The AWG Certification Task Group has completed and published the WiMAX Forum® AeroMACS Test Suite Structure and Test Purposes (TSS&TP) Specification to validate the test procedures for PCT. RCT procedures are published and validated. The IOT procedures to support AeroMACS based on current implementations is now underway to support an overall WiMAX Forum certification compliance for AeroMACS. The WiMAX Forum, ICAO and key industry stakeholders collaborate in the oversight of AeroMACS PKI for the ecosystem in the AeroMACS Advisory Council (AAC). The WiMAX Forum has partnered with Eonti to manage and implement AeroMACS PKI as the Management Authority (MA). The MA is in the process of onboarding Certificate Authorities (CAs), to make AeroMACS operational networks secure with the implementation of AeroMACS PKI. An overview of the AeroMACS PKI process is available here: AeroMACS PKI Users Overview. The Smart Energy Working Group (SEWG) hosted a conference call to members on April 17 with discussions about CBRS, IEEE 802.16s and other WiGRID developments. The next meeting will be scheduled shortly. As details concerning the next SEWG meeting are finalized, we will be certain to keep you informed.